Every year on March 24, APHL recognizes World TB Day, a day to focus on the valuable work of our members and partners. While tuberculosis is often considered a disease of the past, it is resurging and presenting significant new public health challenges including drug resistance. This World TB Day, we are sharing an insightful conversation between two TB laboratory leaders: Dr. Marie-Claire Rowlinson, assistant laboratory director, Bureau of Public Health Laboratories, Florida Department of Health and Dr. Beverly Metchock, team lead, TB Reference Laboratory, CDC Division of Tuberculosis Elimination. Below you will find a complete transcript of this conversation as well as links to more information on TB. Marie-Claire Rowlinson: Hi, Bev. Good to talk to you today. Beverly “Bev” Metchock: Hi, how are you? Marie-Claire: I’m good. So looking forward to having a conversation today. Couple of questions about TB and how you ended up being interested in TB. So maybe I can start and ask you: As a kid, how did you find yourself interested in science? Were you curious about the world around you? Did you always know that you wanted to work in a science related career? Bev: Well, that’s an interesting question, and really not that I can remember. I was a good student overall, and I did enjoy biology and chemistry in high school. I certainly didn’t enjoy physics! And when it came time to choose a college major I was very pragmatic. I chose medical technology because I knew I could get a job. So I kind of went into the field very uninformed as to what it would be. But then when I took my first medical micro course as a junior in college, I just fell in love with clinical micro and I knew that’s where I wanted to go. And I was fortunate in my med tech rotation in a tertiary care medical center, micro was the first lab that I rotated through before chemistry and hematology and blood bank. And so I was able to start working in the micro lab on evenings and weekends, and I was offered a position – a full time position – when I graduated so I was very fortunate to find what I wanted to do, to sort of just fall into it. How about you? Marie-Claire: Kind of similar. I mean, I think I was as a kid was always interested in biology and space and medicine and those kinds of things. But actually it wasn’t until high school that my biology teacher, when I was looking at degree courses to take, told me that she thought I would be a great microbiologist. And I don’t know if she knows what a profound impact that she’d go on to have in my life. I think it also happened to coincide with the film, Outbreak. I don’t know if you remember that. I think I really wanted to be a disease detective, but, sort of like you say, I don’t think I really knew exactly what I was doing when I got into medical microbiology. But I think I always dreamt of having a career in science, and I still have some parts of that dream yet to realize. I think it’s an exciting field to be in. Marie-Claire: Can you think of a person or an event that inspired or encouraged you to get involved with public health laboratories or TB testing specifically? Bev: Well, when I was working in the hospital as a medical technologist in the micro laboratory, I actually became interested in hospital acquired infections and antibiotic resistance. Personally what happened is my father had a hospital acquired – post-surgical infection – at the actual hospital where I worked. And then I was fortunate to be able to work – at a different situation – but work with the infection control practitioners and be the microbiologist that was involved in an outbreak of aminoglycoside-resistant Enterobacteriaceae in the neonatal intensive care unit. So I got very interested in hospital acquired infections, hospital epidemiology and antibiotic resistance. And, to be quite honest, I was one of the people who thought people don’t get TB anymore in the United States. So my original career path when I finally did go back to continue my education was in a school of public health because I wanted to get a background in epidemiology and statistics, and I thought that was the path I was going to go. But then when I got my job at Grady Memorial Hospital in Atlanta I had to become an “expert in TB” out of necessity because there was a lot of TB in Atlanta and since then there’s been no going back. I’ve been in and been involved in TB diagnostics since. How about you? Marie-Claire: Well, I think that’s so fascinating that you say that because I, sort of in a way, have a similar story. So my Ph.D. is in parasitology, so not related to TB at all, but I did do quite a lot of international work when I was doing my Ph.D. I guess I was kind of always interested in tropical medicine or at least diseases that disproportionately affected disadvantaged populations and people who maybe didn’t have access to adequate healthcare including lab testing. But similarly like you, growing up in the UK, TB felt like a disease of the past or from another country. As you said, I think we all know that that’s not the case. And, in fact, in the UK there’s been a real resurgence of the disease in recent years. And when I was thinking about this podcast, doing some research, I saw that there were 10.5 cases per 100,000 population in 2015 (this is in the UK), but this was down from 15.6 per 100,000 in 2011 compared to three cases per 100,000 in the US in 2015. So, I mean, at that time when I was in the UK, I didn’t really think about TB, but now that I know so much about it and realize that it really is a great challenge in clinical diagnostics and in public health. Bev: Similarly when I was at Grady that was a time when TB was “resurging” in the United States. And so there was a lot of pressure in the micro laboratory to do quicker diagnosis, to implement the newer technology that was available. And I remember in a matter of a few years when we went from just doing culture on solid media to transitioning to the radiometric broth method to incorporation of DNA probes for identification and then nucleic acid amplification for direct specimen testing. And I recall the days when… I remember one particular situation where a physician called and said, “This can’t this can’t be right.” And I said, “What do you mean?” He said, “We only sent the cultures down three days ago and you’re telling us it’s TB.” So the transition from taking weeks to months to just a few days – to be so very involved in that transitioning in such a short period of time and thinking about how long we have been doing things the same way and then all of a sudden there’s like this revolution. It’s a very exciting field to be in. Marie-Claire: Absolutely. Can you think of any people or mentors who particularly inspired you? I have a couple to mention, for sure. Bev: Well, like I said, at Grady the medical director of the micro lab, Dr. John McGowan, and then the supervisors in the laboratory, Portia Williams and David Lonsway, they taught me a lot and we’re all very involved together with working out how we were going to handle the situation in the medical center and working with the folks in the Georgia Public Health Laboratory to coordinate testing. Obviously, it was before I was at CDC, but working with the people here at CDC to coordinate testing that was being done here at CDC so we can get results as rapidly as possible. There’s a lot of people that were involved, and one I particularly remember as well was a hospital epidemiologist at the time, Hank Blumberg, who was a very young enthusiastic person who we worked really closely with his team in infection control and hospital epidemiology. How about your folks? Marie-Claire: Well, I was quite lucky. When I came to the US to do my post-doctoral fellowship at UCLA, I sort of knew that I wanted to go into public health and actually Dr. Ed Desmond really encouraged me whilst I was doing my postdoc to go into public health and mentored me at the California state lab for two weeks. He arranged for me to go for a visit there for two weeks and spend that time with him. And I’m sure as the listeners out there know, Ed Desmond is a pretty renowned TB lab expert, so I was lucky to have him as one of my first mentors and he’s still a mentor to me and we still get to work together quite often. So that’s exciting. And then I suppose… I actually worked at APHL after I did my postdoc and I was in the global health program. So I was doing quite…although it was mostly focused on HIV there was still a big TB component so that was also a big driver for me in terms of public health labs and TB. But when I left APHL and joined Florida Department of Health, I was actually hired by Dr. Max Salfinger, who, again, people may be very familiar with his name, he’s a pretty renowned TB expert as well and has been an incredible mentor to me. And even though he actually moved to National Jewish Health shortly after I joined the Florida Department of Health we still – so this is six years later – we still have bi-weekly TB calls. So that’s made a big impression on me and been a big reason why TB has been a big part of my work. I think I would lastly mention also that the lab here in Florida really is a state of the art lab, always pushing the envelope, being involved in studies, and I think having such a strong lab in Florida and also having such a great collaborative relationship with our TB control program has been instrumental in my work in TB and my interest in TB. And I particularly I love working with Dr. David Ashkin, he’s our TB medical director for the Florida Department of Health, and he’s really inspiring and really dedicated. And actually, he does an amazing job of engaging the lab in the work that the TB control program does. So we really get to hear about the clinical side of TB care and the importance that the lab results have on patient care because sometimes we’re in the lab and we never actually hear about patients, but he really involved us in that and all the other facets of TB control and I find that really fascinating. Bev: Yeah, I think that’s one of the most enjoyable parts of my job – is interacting with our public health laboratory partners, but state and local TB control practitioners, the TB clinicians… And TB laboratory work, I mean we are so important in the whole team of taking care of a patient and I think in some respects that’s unique in the clinical micro world that we are involved so much in laboratory results. And I think that the clinicians that we deal with understand that and treat us as part of the diagnostic team. So that’s the part I really enjoy of my position here. Being part of a team. Marie-Claire: Yeah. And that’s the same feeling we have here and even the bench – I know the bench techs really feel a part of that team as well like everybody is involved in that process. So it’s really good. Marie-Claire: Do you remember what first drew you into TB? Or was it really just being at Grady and being in Atlanta and seeing the resurgence of TB and TB cases? Bev: I was drawn in out of necessity – to be able to do what needed to be done. But it was an interesting time because technology was changing, we were dealing with a lot of cases and trying to implement new testing, new technology in the laboratory. Like I said earlier, I would have never thought I would end up working with TB, but once I started it was really something I really enjoyed and being involved in that. Marie-Claire: Yeah, I think once you start working on TB you realize how interesting it is. I think I love it because it’s so interesting for so many reasons. I mean, you think about it being such an ancient disease that you think about history, music, art, literature, I mean it’s steeped in TB references. So I can go back to books that I read when I was younger and be like, “Oh, there was a TB reference in there!” or “That composer died of TB” or “He was writing this piece of music or painting this painting when he was afflicted with the disease.” So I think for me that’s really interesting. And then from another standpoint the fact that people can be exposed to TB but never develop symptoms or maybe only become symptomatic under certain situations later on. That makes it difficult to diagnose. And now with multidrug resistant TB and extensively drug resistant TB and things like coinfection with HIV, it’s driving more disease and driving morbidity with disease making, I think, accurate and timely diagnosis even more important. So I think all of those challenges for me make it really interesting, and so with this goal of TB Elimination I feel that we’ve got our work cut out for us. Marie-Claire: And I suppose I have to say again, for me being drawn into TB and why I’ve stayed interested in this field as well is that working in that team with these really dedicated people every day – the TB nurses and so forth in all the counties – are just so dedicated. Bev: Yeah and that’s the thing. You know, if you don’t get outside the lab, you don’t realize that. But the dedication of all the folks who work with patients who have TB. And I think that’s why I enjoy when we have the National TB Controllers conference in the National Laboratory meeting that all those folks get together. It’s such a strong… it’s such a good feeling and a good meeting, and you meet your peers and people you talk to on the phone you meet them in person and everybody’s working on the same team. It is a really rewarding opportunity that I have here to have this job. Marie-Claire: Absolutely. Can you… Thinking of that kind of thing, can you think of a specific case or situation where you really felt the impact of your work? Or your lab, the impact for you or your lab… the impact that your lab had on a community or a patient. I guess being at CDC even more broadly you have a national impact on TB lab diagnostics. Bev: Yeah, I don’t want to really mention any specific cases. There are certain cases I can recall from my days at Grady and in certain cases that we’ve been involved with here with laboratory testing at CDC. But I think… we feel that the group here in the reference laboratory, I think we feel the impact all the time. We get phone calls from physicians, phone calls from TB control programs, obviously from the laboratory asking about testing. And once we implemented our molecular detection of drug resistance testing service I think we demonstrated that referral of specimens or isolates worked within the United States and we can get results out in relatively good real time that really impact decision making around particular patients. So whether it’s… somebody is a caregiver in a nursery and we can say fairly reliably it’s not drug resistant TB within a day or two versus letting them know “yes, indeed you have a case that’s drug resistant TB” and we know it’s going to be resistant to these other drugs, that the physicians can make good decisions about how they’re going to treat that patient. And I think how we impacted that kind of decision making. When we started the testing service – when before we started and we were talking to experts about “this is what we’re going to do,” one of the questions I was asked was, “Well, how many specimens do you think you’re going to get?” And I honestly didn’t know. I didn’t know if folks were going to use the service, if they’re going to trust the results or are still going to do the rapid molecular testing and still wait for the traditional growth based drug susceptibility testing. And that has – I think it’s a little bit changed over time – but I think now that’s one of the first things that folks go to and I know for you in Florida, you do the Hain tests and it’s the same. It’s the same type of thing that they get immediate information that either I would think either makes them feel relieved or knowing that now I can make a decision about what I’m going to do next with this patient based on the rapid tests that the laboratories can do. Marie-Claire: Yeah. Even if it’s just to hold medications while waiting for something right. I think that for turnaround time makes a huge difference. I know you know, but we use the MDDR service a lot and it’s really amazing. And our physicians and providers that are big users of the MDDR really rely heavily on the information that comes from that. It’s a really wonderful service. Marie-Claire: Yeah, I mean, for us, I feel that being in a state, we sometimes have these cases in situations where we can really feel the impact of our work. And as I’ve said before really being involved as a team with our TB control program. If I think at a community level… the Jacksonville Bureau of Public Health Labs is in the county, Duval County, and we actually had quite a serious TB outbreak. I don’t know if you remember back in 2012. Marie-Claire: It infected the homeless population in Duval County, and so over the last six years the county has really made great strides in this patient population. And one of the ways that the lab has been involved in this effort is, in fact the last two years, our lab has been doing IGRA testing for their shelter card program. The shelter card program is the system to routinely perform testing and assessment for symptoms of TB for Duval County’s homeless clients that are seeking admittance to area shelters. So this has had an important impact on preventing transmission of TB amongst the homeless population, and so for the lab to be a part of that effort has been has been really interesting and really great, and having the opportunity to implement IGRA at our lab and see it have an impact has been really interesting. And then if I think about specific cases, as you said, there are several cases that come along every year that are really interesting, but I always have one that comes to mind because we had a really complicated patient a few years ago that – despite having no risk factors – he had disseminated TB. In the lab we were able to confirm diagnosis. We were able to confirm that it was disseminated TB by confirmation of TB from several body sites including CNS involvement and it actually turned out that strain had an rpoB mutation which was associated with low level resistance to rifampin. And so the TB control program actually ended up treating this case as MDR TB and I think over the course of time the lab received 20-plus specimens on this patient. And so, about a year and a half after that, it was actually amazing, we got to meet that person. Marie-Claire: Yeah, and hear his survivor’s story. You know, sometimes we actually do get to meet the patients. And that was that was really inspiring for me. And he was successfully treated. Marie-Claire: Even hearing the survivor stories at the NTCA conferences, I think as you said, makes the job really rewarding because you see that all of the efforts of the lab, of the program, treating physicians and clinicians, everybody that’s a part of that team and helping these patients. So when you actually get to hear the survivors on the stage it’s pretty amazing it’s pretty powerful. Bev: I absolutely agree. To hear the stories and what they have to go through with taking drugs that have side effects or the stigma of having TB and all those things. It really is. If you didn’t understand. You know, sometimes we have folks in the lab who are doing research or visitors and they don’t really understand the full effects, and that when they hear those stories they really understand it, and it’s inspiring what these patients who have TB go through and it’s great that they’re willing to share their stories. Marie-Claire: I agree. Well thank you, Bev, it was really great talking to you today! Bev: Well, thank you, Marie-Claire! I really appreciate the chance to have this conversation. Marie-Claire: We’ll keep working towards a TB free world. Bev: We can only hope. The post Lab Culture Ep. 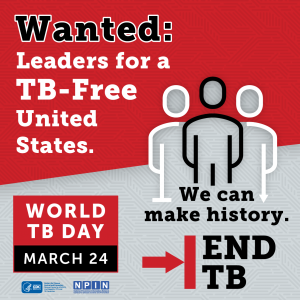 8: Leaders for a TB free world appeared first on APHL Lab Blog. For many in the United States, Mycobacterium tuberculosis (TB) is not a concern. It is viewed as a disease that is uncommon in the US and seldom a real threat to your average person. This could not be further from the truth. There are two types of TB: TB disease and latent TB infection. A person with TB disease has an active infection, is presenting symptoms and is contagious. A person with latent TB has TB bacteria in their body but doesn’t have any symptoms and therefore is not contagious. However, a person with latent TB can develop TB disease at any point in their life, present symptoms and potentially infect others. Because people with latent TB are asymptomatic, many latent TB infections in the US go undetected. In 2014, there were nearly 10,000 TB cases reported in the US. Relative to other infectious diseases, 10,000 cases may seem low in a nation of 318.9 million people. However, this number only represents those with active TB disease, not the total number of people who are actually infected with TB. So how do we count the number of people with latent TB infections? CDC’s Division of TB Elimination (DTBE) estimates that up to 13 million people in the US have latent TB. A study conducted by DTBE suggested that only 11.4% of active TB disease cases are attributed to new infections and that the percentage of infections from latent TB could be as high as 85-90%. So while the number of active TB cases has been declining since its peak in 1992, TB has the potential to become resurgent in the United States through these latent TB cases. 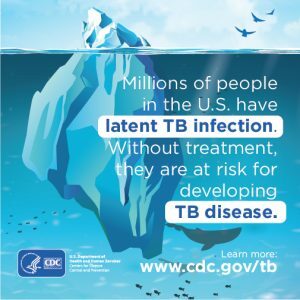 Thus the goal of TB elimination in the US can only be realized if latent TB cases are routinely identified and the patients are promptly treated. Detecting latent TB infections is critical to TB control efforts. When a person with latent TB is diagnosed, they can be treated prior to becoming symptomatic and infectious. However, because a person with latent TB has no active infection and therefore no symptoms, diagnosing latent TB requires a test or tests that looks for signs that the bacterium has infected the body. The tuberculin skin test (TST) is the most well-known. Many of you have likely had a TST. You would have received a very small injection under the skin in your forearm and been asked to return to your health care provider’s office a few days later to be checked for an immune response that would appear as an induration (large red blotch). In addition to the skin test, there is also a newer blood test: the Interferon Gamma Release Assays (IGRA). Much like any other one-time blood test, your health care provider would draw your blood and send the sample to a laboratory for testing. The results would then be communicated to your provider who would share them with you. While this test is most commonly performed by hospital or commercial laboratories, public health laboratories around the nation are working with CDC to increase implementation of IGRA testing to make it more widely available. This expansion will improve the detection, treatment and follow-up of individuals with latent TB infections. Neither these TB tests are perfect, but together they give us a fundamental toolkit to identify latent TB cases. 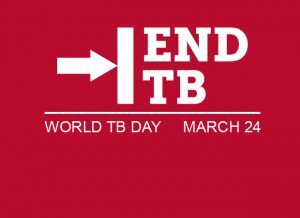 This year, the theme of World TB Day is, “United to End TB.” Along with our partners, APHL is working to make “End TB” a reality, not just a campaign slogan. We feel strongly that public health laboratories play a vital role in accomplishing this goal by increasing access to TB testing in the US.